I've been on BugGuide for a decade. This is an expert-curated Web site where you can upload observations of any insect - and many other arthropods - seen in Canada and the continental United States. I've learned a tremendous amount from the experts there, both professional and "amateur", and continue to do so. However, it is curated; I've had many of my photos "Frass"'d - trashed - because they did not meet someone's standards for image quality. ("Frass" is caterpillar excrement.) So I can't rely on BugGuide as a record of my observations, even for insects. Even so, I've often wished for the equivalent for plant identification. The widespread availability of handheld computers with visual processing capabilities - i.e. "smart" phones with cameras and displays - has given rise to applications such as PlantSnap to help people ID plant "on their own", without having to ask others for help. I've not been impressed with the accuracy of such apps. And better alternatives are available. The rise of iNaturalist has been astonishing, and refreshing. Anyone can upload any observation of any living organism anywhere in the world. The technology behind iNaturalist is also a decade ahead of BugGuide. Geotagging and labels are automatically picked up, you can explore observations by region or place, or even just be exploring a map. Anyone can assist in identification. This community aspect raises it up to the level of social media. I know a lot of conventional garden plants; I can help those who don't know a Rhododendron from a Hydrangea by identifying their observations. I may even be able to go back to the same plant to confirm what it is, using the geolocation. In this way, I've made more identifications of others' observations, than observations of my own. When I'm sharing my knowledge, informally or formally, I find that people welcome the opportunity to learn new ways of seeing. It could be discovering that there are different kinds of bees, or that an asteraceous "flower" like a daisy or sunflower is not a single bloom, but hundreds of flowers. I've yet to come across someone who wasn't excited to learn something new about living things that have been there all the time, right around them, where they live, not in some distant, inaccessible "preserve". We've had an unusually rainy year. The first half of this August gave us twice as much rain as the average month. 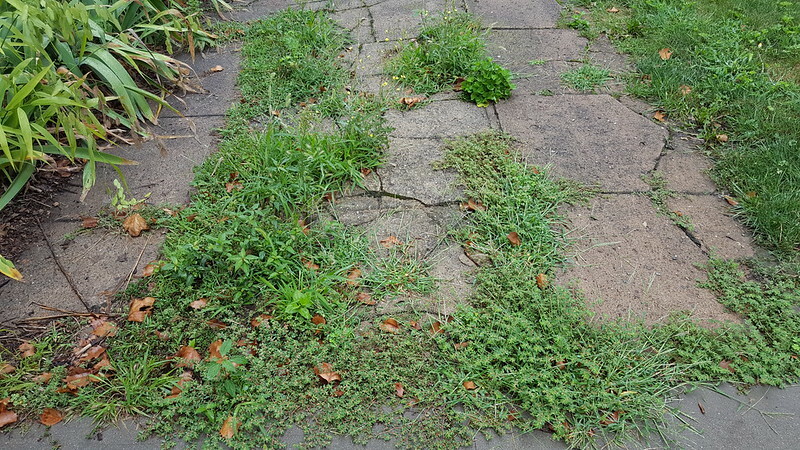 A good time for the weeds; not so much for the gardeners. 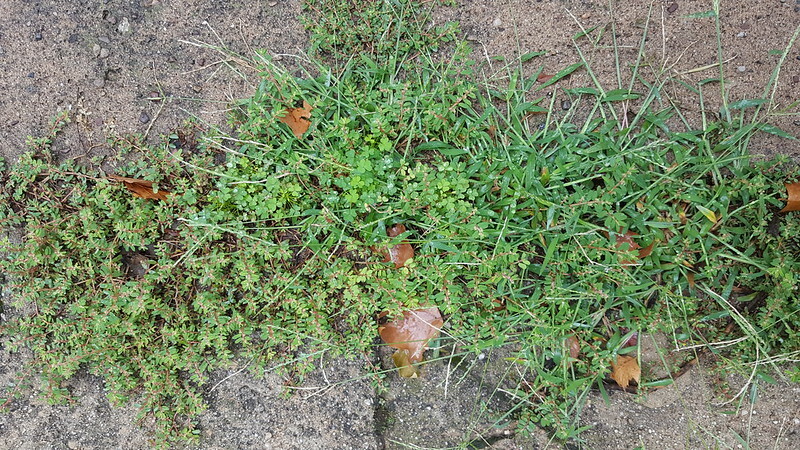 I've been joking that the weeds are so out of control that I should do a "Bio-Blitz" of my own driveway. And why not?! Let's get started. 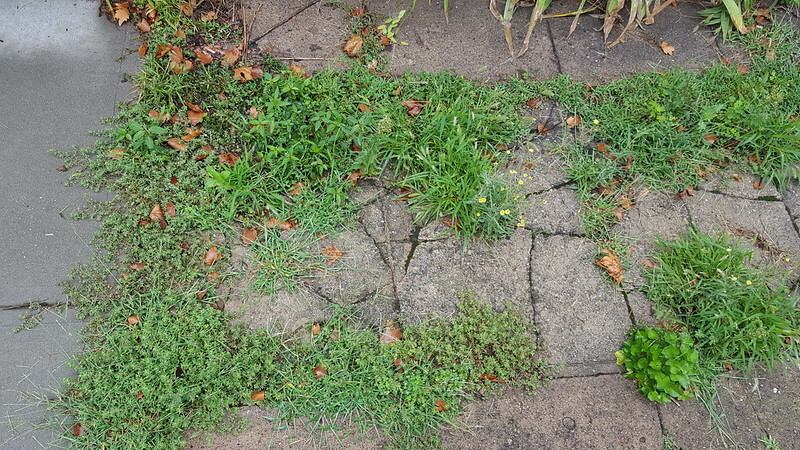 Here is a small section, maybe 10 square feet in total, of the broken up concrete we call a driveway. How many different plants can you find in this photo? (Don't worry, we'll get some closer looks.) If, at first, your eyes glaze over and just see green, let's practice. Are there any differences among all that green? Is it all green? I see some yellow and brownish spots (aside from the leaves) in there. Even among the green, is it all the same shade of green? Some is lighter, some darker. Maybe some has more yellow in it. How about texture? Some seems coarse, some seems fine. Maybe those are different leaves, warranting closer inspection. Instead of looking down, let's look from the side. Now we can see there are many different heights and shapes of the plants themselves (and more evidence of an inattentive Gardener). The field of green starts to distinguish itself into groups of vegetation, even individual plants. Let's start to look at some groups. Let's call them A, B, and C.
Group A: How many different kinds of plants can you see in this photo? Group B: How about this one? Group C: Feeling confident? Let's go back to the photo at the top of this post. How many different plant species are in this small patch, no more than two or three square feet in area? 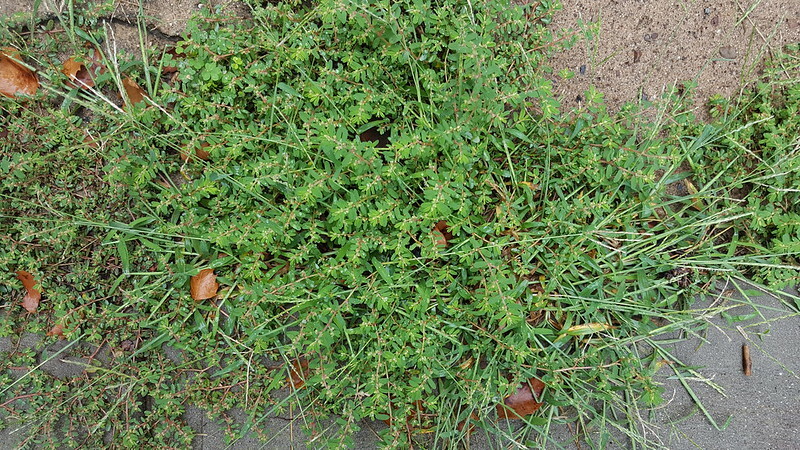 B: 3, at least: The above two, plus Oxalis stricta, a native weed. C: 7, at least: The crab grass and Euphorbia, plus Viola sororia, a foxtail grass, horseweed, and two I'm going to iNaturalist to ID to species: an Acalypha, copperleaf, and the one with pretty little yellow flowers (seems like a Sonchus, a sow-thistle, but the flowers don't look right). Now, I'm still a native plant gardener, and it is a driveway, not a garden bed. Once I'm done with my IDs, I'll pull all the weeds. 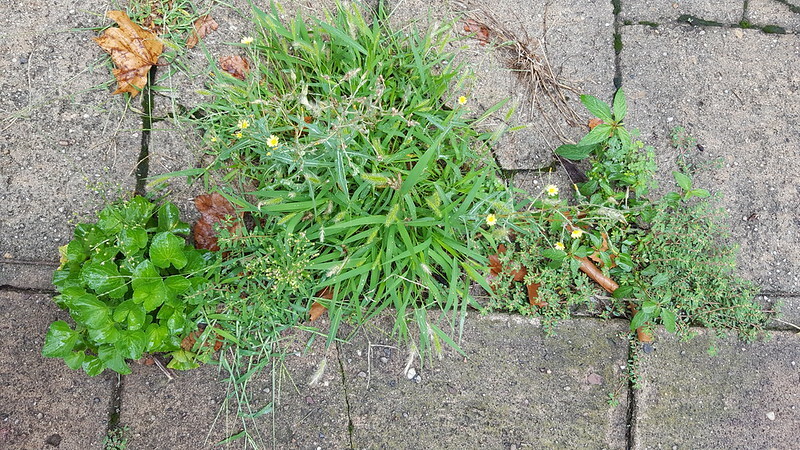 But knowing which weeds are native, and which are not, I can "edit" my weeds more selectively elsewhere in the garden, leaving the natives to pop up where they like, and reducing the competition from the non-native species. Thread by thread, I can weave ecological associations back into the landscape, even if it's just a few square feet at a time.